After roughly two months of back and forth, Fast & Furious 9 stars Tyrese Gibson and Dwayne Johnson have ended their feud. 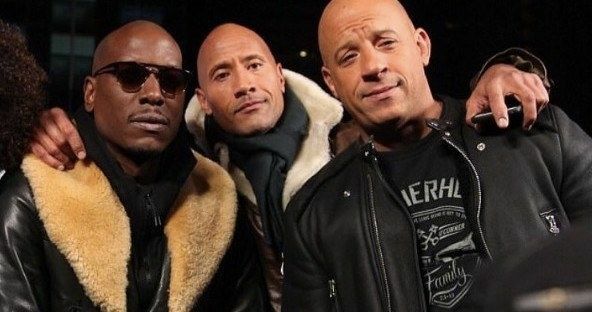 Tyrese Gibson sent out an Instagram photo of himself, The Rock and Vin Diesel, which is ironic since The Rock and Diesel recently ended their own feud. The photo was accompanied with a message, claiming this will be the last time he ever posts about "Dewayne," even though he still purposefully misspells the actor's name, and basically states that he still feels the same way. Here's what Tyrese Gibson had to say on Instagram earlier today, where he also expresses his excitement for director Justin Lin returning to the franchise in Fast & Furious 9. "Want you guys to know I had a real Heart to Heart with one of Dewayne's associates and this will be my last post about him. I repeat my last. I respect the associate who called. My story will never change I was never DJ's Co-Star. I'm Shayla's Father first. Justin Lin is back in the driver seat that's exciting cause it's going to feel like the true #FastFamily all over again. When we see Justin we see Paul." The feud started back in September, when Tyrese begged Dwayne Johnson to drop his Fast & Furious spin-off that he was planning with Jason Statham. Just a few days later Universal Pictures pushed the release of Fast & Furious 9 to 2020, and later confirmed that this spin-off is happening in the summer of 2019. From there, the feud got worse, with Tyrese calling out "Dewayne" for making the franchise all about him, with his spin-off taking precedence over Fast & Furious 9. This feud even caused Vin Diesel to respond, claiming that it would be, "unfair to say it is anyone's fault." Earlier this week, Tyrese Gibson threatened to bail on Furious 9 if they kept "Dewayne" on as Luke Hobbs, calling him a "clown" and "#CandyAssBitchMade" while essentially accusing The Rock of taking steroids to enhance his physique. While it isn't known who "Dewayne's associate" was that reached out to Tyrese Gibson, apparently he or she convinced him, at the very least, to stop posting about The Rock. While Tyrese Gibson may not be posting anything publicly about The Rock anymore, it seems there may still be some ill will between the two, although it seems unlikely that won't be aired in public anymore. Aside from a few cryptic jabs here and there, Dwayne Johnson hasn't fully responded to Tyrese's claims, and it will be interesting to see if another feud ignites when production gets under way on Fast & Furious 9. Take a look at Tyrese Gibson's Instagram photo below.